Draw 'T Lisp Option #5 was added to this already powerful program. Now the output is fully linked parametric code, simple & easy! The DansMark Way! Don't be fooled by the ignorant people on the web saying "It's no better than a block!" This program produces the results that you're looking for! Auto .dwg to .lsp! 'Nuff Said! Update: Tested with AutoCAD 2012, it works correctly! Update: Now creates finished parametric programs at as fast as you can think! Update: Lessons designed for beginners with no previous programming experience! Update: Lessons teach users how to use Drawing2Lisp_Converter! Update: Lessons teach users how to create user options and add modifications to the converted code! Update: After completing the available lesson's, user will be advanced enough to create all their own Automated Drafting Systems with ease! CatwalkMaster updated to work with newer versions of AutoCAD. Draws Plan-views, Elevations (for erection drawings) & Shop-Drawings, complete with section-view & B.O.M. 'S (Bill-Of-Materials). Draws Catwalks for almost any type of application. Auto-modes and complete Help-Systems too! Seems MicroSoft has stopped supporting VB... here's AutoDesk's fix! There was a malfunction in the download (wrong directories). This draws full 3D Staircases and the 3D Concrete Base that is designed for the staircase. See the Cast-Stone Webpage here! This draws Custom CastStone Window & Door Surrounds in both Elevation & Plan-view. Included the ability to add YOUR custom CastStone-Shapes to the program, for faster custom designs! This draws Custom CastStone Banding in Plan-view (more if you need it!). This program was developed for Custom CastStone drawings. Add text to your drawings fast & easy by picking predefined text from the dialog. Includes the ability to add YOUR custom Text to the program, for faster custom designs! This program was developed for Custom CastStone part drawings. Creates slides (.sld) of your drawings quick and easy! Allows the user to find a directory of drawings, then creates slides of all drawings in that directory! Add Custom Quoines to your drawings fast & easy by defining sizes and grout thicknesses in a dialog. Includes the ability to pick lengths in drawings, for faster custom designs! This program was developed for Steel Detailing. Draws Custom Wall-Rails in your drawings fast & easy. The whole block is a program that updates itself (if the variables are changed before the program is run, from another program for instance!). Why would you draw anything when you can automate everything? This program was developed for Custom CastStone drawings, but can be used for any legends and symbols you have. 1) Pick the block from a directory. 2) Pick a block in the current drawing. The program create a slide of the block, them adds it to the current dialog "object-list", then adds the block to the "Legends-Symbols directory", so you can start using it instantly! 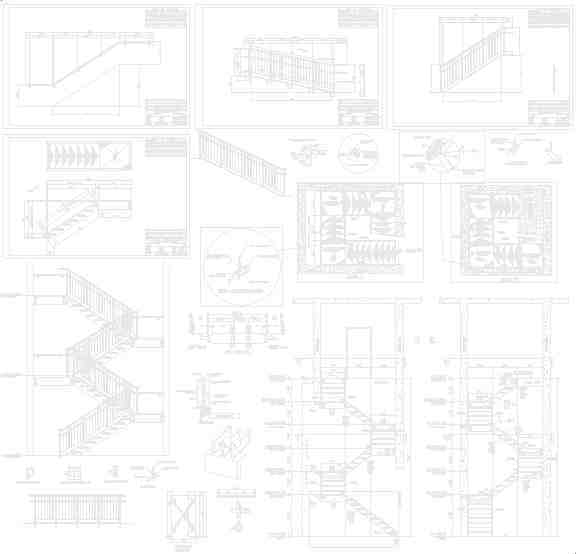 This draws full shop drawings of flat and sloped pipe railings (including a full bill-of-material). Also draws wall rails (the matching wall rail can be drawn right after a sloped rail, using the same rise/run info).